100 Red Lip 3x5 Resealable Bags. 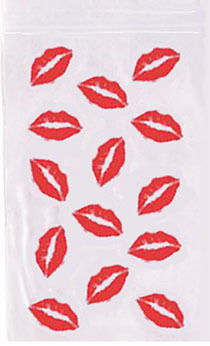 Pass out samples using these cute red lip resealable bags. Holds your product in place without falling out during transport. Red Lip design with clear background so you can partly see your business card and samples that are inside. Just drop in your samples and card and zip the envelope closed! I love the lips bags, I use the for samples for my avon business. they are cute. www.youravon.com/tlaporte. I LOVE these bags! I add a business card and sample and hand them out when I''m out and about. They are the perfect size and I am back to order more. JUST PERFECT FOR A SAMPLE PACK , BUSINESS CARD , & A HERSHEY KISS! Everyone loves the kiss and treat gift with my card! I looove these adorable bags! Perfect for a biz card and sample for potentials! Already recommended them to my downline! Use these cuties every day! I pass these out with the new color 101 cards in them with my business!Customers love them! These bags are PERFECT for disposable applicators that I use in my facials and classes! My assistant packs up dozens ahead of time and they are ready to go! I use to spend alot of $ on sample bags, but these are cheaper and cute! I love these little zip lock bags. They are so handy for samples and lots of little items in orders. And I get lots of great comments about them from my customers.